Rediscover Classic Fairytales with the Magic of Augmented Reality from SpinTales! 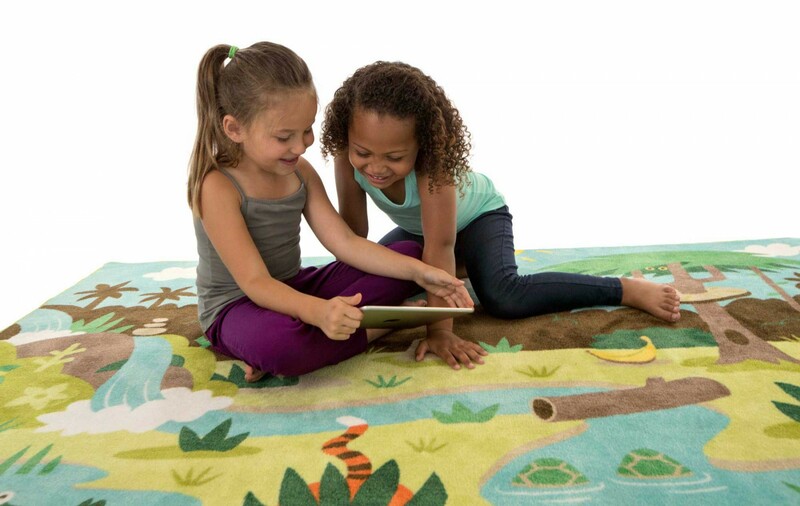 SpinTales is an augmented reality storytelling rug and duvet for kids! Finding balance between technology and meaningful bonding time with children can be difficult in this tech-driven era. The way children learn and interact has shifted to a digital space – children are born immersed into a world of fascinating technology. SpinTales has the answer – a new type of storytelling that brings characters and stories to life through entertainment, educational activities and interactive games. Experience is a new type of interactive storytelling where a world of classic fairytales and jungle adventures comes to life. SpinTales is the first of many products by the company Tilt and they aim to create even more amazing products to inspire, enrich, stimulate and entertain. 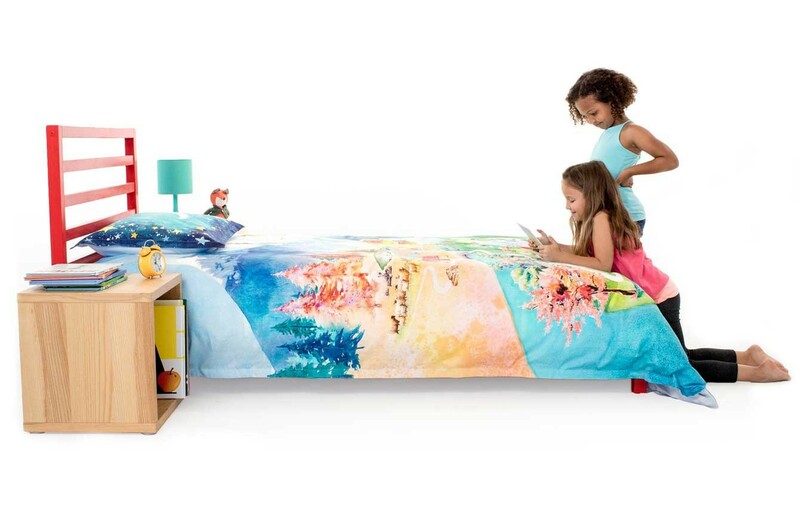 With the magic of augmented reality and beautiful home textiles, the SpinTales Enchanted Duvet and Jungle Rug bring classical fairy tales to life. 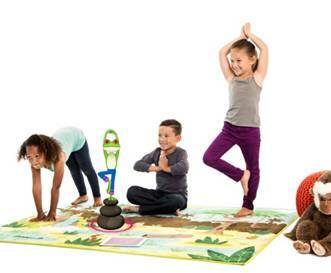 Do yoga with a frog and learn to juggle with our favorite jungle explorer Milo on the SpinTales Jungle Rug, or explore the forest with Little Red and make sure to feed The Giant on the Enchanted Duvet. Simply set up the product, download the free SpinTales App (compatible with iOS and Android tablets) and discover the magic! Includes 3 FREE stories…hidden in a jungle of adventures! A beautifully illustrated twin duvet set for a kid’s bedroom that comes to life with three interactive stories that you can read, touch and play: Little Red Riding Hood, Three Little Pigs, Jack And The Beanstalk. Experience the characters and stories that you and your kids already know and love in a new way. Includes 3 FREE stories…hidden in an enchanted landscape! SpinTales is a new world of adventure that mixes digital and physical experiences in the space between your iPad and your duvet or rug. 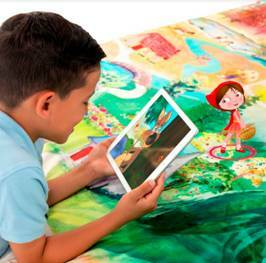 Beautiful textiles and augmented reality combine to create a revolution in storytelling that your kids will love. It’s simple to set up, easy to download the free app and all you need is a connection to the internet and a lot of imagination! To access augmented reality, a marker will appear and the camera on your device will turn on. Find the matching illustration on your duvet or rug. Hold your device over the marker and the augmented reality will be activated. Check out this video HERE to see SpinTales magic in action! Let the fun begin!